Our Church in Antarctica, a great offer by “Antarctica Polarreisen GmbH” – W.A.P. I’m happy to share the following information with all our supporters. 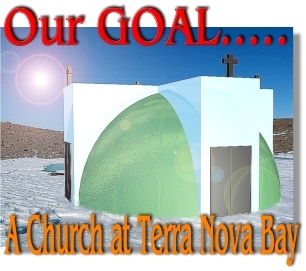 If you want to build your church in Antarctica, we would be glad to offer transport facility by plane or ship. Just pay a visit to http://www.antartida.de and you will discover more ! Thanks immensely to Capt. Kai for such a GREAT offer! 4. Bulgarian St. Klimend Ohridski Base. not have nothing to feed spiritual needs of its personnel. I did start to involve authorities, politics, media (newspapers and TV) and of course the PNRA (the National Antarctic Research Program, which is the authority having responsibility and jurisdiction on the Italian installations and research programs in Antarctica), to sensitize the pubblic opinion and the institutions about this matter. Bureaucracy is a huge problem, particularly in Italy and of course, we are still working in trying to convince PNRA to give the authorization. Also we have involved the Vatican through the official channels such as The Secretary of State Vatican (Mons. Tarcisio Bertone) and CEI Italian Episcopal Conference (Mons. Angelo Bagnasco). After my last national TV interview, I have been called by Italian Companies who have offered to build and donate the church. In fact, 2 Companies in Italy did offer to build the Church in Antarctica. They are: Saint Gobain and Bertero Technologies located in the city of Cuneo in the North West part of Italy. container ready to be shipped to Terra Nova bay in Antarctica where the Italian base is located. Unfortunately every thing is actually still pending as permission is not been given yet!